My guest this week is my sister in law Arti. She is my hubby’s sister and the youngest.Yes we have two Arti’s in the family… my brother’s wife and my hubby’s sister. When I got married, Arti was very thin.I thought that if somebody huffed and puffed and blew her away, she would probably fly away. Her friends became my friends as I didn’t know anyone in Mombasa(except for my aunt’s family). At social gatherings she would make sure that I was not left alone. We didn’t spend that many years together as after my marriage she went off to UK to complete her beautician course. She came back and that’s when her training in the kitchen began under my mother in law. At breakfast time Nunu would explain to her how the dish she was supposed to cook is prepared. I too would have my ears open. When I had my twins, she was a great help to me. My daughter Nami would cry in the evenings and the only person who could keep her quiet and calm was Arti. She had to keep rocking Nami for over an hour! Arti has always has been helpful and caring towards my children. They love spending time with her. I will never forget the short holiday we spent together when she visited Montreal. Its probably the most time I’ve spent with her after she emigrated to US. We had a wonderful time with her. My other memorable time with her is when she gave birth to her son. She had come down to Mombasa for her delivery. As my kids and her daughter were pretty young, Nunu decided to look after the kids at home while I went with her to the hospital when her labour pains began. I don’t think I was scared when I gave birth to my kids but was really scared when she got exhausted and was finding it difficult to deliver her son. For me that was a nerve wrecking experience but by God’s grace, all was well in the end. I have so much respect for her as she is a caring, loving and hard working person. Arti is a good cook and we all love her peas kofta curry and her farsi puri. When my brother first my bhabhi, he was over the moon, talking about her beautiful long hair which she cut off before the twins were born. Bhabhi had culinary skills from the time my brother got married to her. She would always surprise me by baking beautiful cakes on my birthdays. My children Veer and Pooja would always love to spend their holidays at mama and mami’s house. Bhabhi has been very supportive when I made the biggest decision n my life of moving to US from Kenya. She helped me to clear the house, packing our goods and cooking meals. Add mustard, cumin seeds, cloves, peppercorn, cinnamon. When the mustard seeds begin to crackle add a pinch of asafoetida. Add the chopped onions and garlic paste. Stir fry for a few minutes. Add methi, spinach and potatoes. Add salt, cumin, coriander, chilli and turmeric powders. Add ginger and green chilli paste. Mix well. Cover the pan and cook till the potatoes are done. Add tomato puree, sugar and pav bhaji masala. Let the tomato puree cook for 4-5 minutes. Add the fresh cream.You should get an orangish colour gravy. Garnish with fresh chopped coriander.Serve the curry with parathas or rice. This sounds like a really delicious curry. 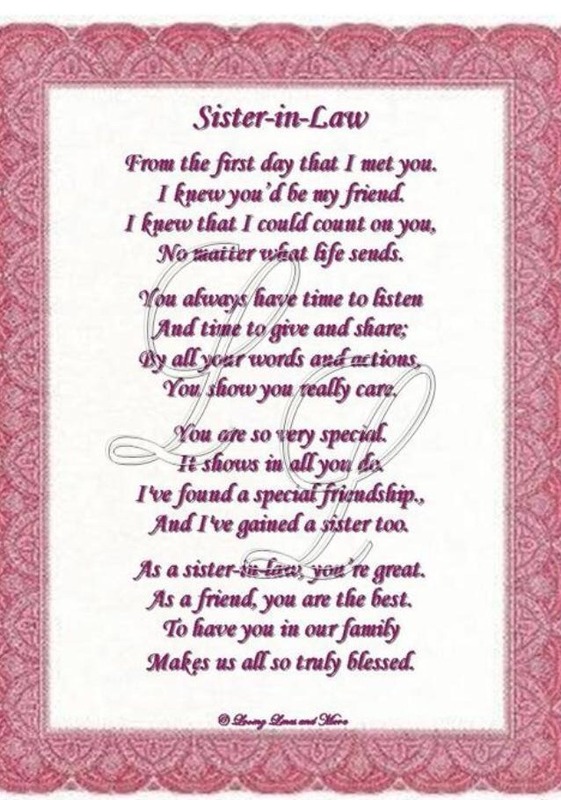 Its lovely to read that you share such a lovely bond with your sis in law. This sounds delicious and healthy, as you added methi and palak together, I am going to try soon. Nice post dear. Thanks Sadhna, am sure my sister in law will be happy. Please let us know how it turns out. A simple and comforting meal. 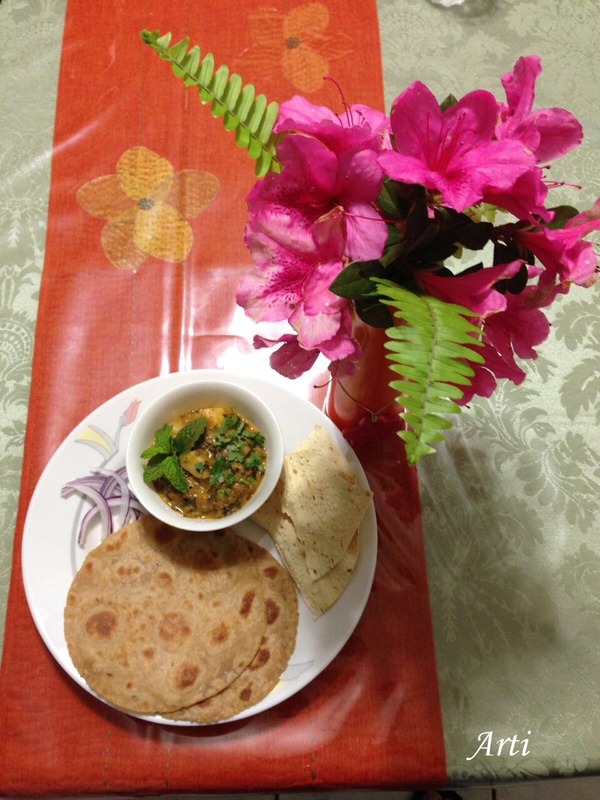 roti with yummy and healthy sabzi. A lovely way of introducing your family to all of us. I love reading about your family and how close all of you are. This curry sounds great. I like the idea of adding pav bhaji masala to the curry. Never done that but must try next time I make this type of a curry. Thanks Mina, I truly am blessed to have such a close knit family. my siblings,cousins,hubby's family, we all have a great time when we're together.